2x HLTAS to lead Maths 1st class @ number intervention in Year 2, Fresh Start in years 5&6 and Project X in Year 4. 0.5 Family Support Worker to work with identified families – leading CAFs. The school uses a range of data to evaluate the ongoing impact of current Pupil Premium funding including looking at children’s progress at Pupil Progress Meetings, monitoring the effectiveness of intervention programmes, and checking on children’s ability to access out of school activities. Similarly, at Personal Education Plan meetings for Looked After Children, there are discussion about the use and impact of the Pupil Premium. As a result of increased provision, we have significantly improved the numbers of disadvantaged pupils making expected and more than expected progress in all subjects over time. There is also an upward trend in numbers of disadvantaged pupils achieving level 4 in Reading, Writing and Maths. There was a significant increase in the proportion of disadvantaged pupils achieving level 5 in Reading, Writing and Maths. The table above shows that we are successfully closing the in-school gap between disadvantaged and non-disadvantaged pupils in all measures of attainment. 100% of disadvantaged children made 2 levels of progress from Key Stage 1 to Key Stage 2 in Reading, Writing and Maths. a greater percentage of disadvantaged pupils than non-disadvantaged children achieved Level 5 in reading, writing and maths as a result of increased provision. This was a clear action on our previous Pupil Premium reports. 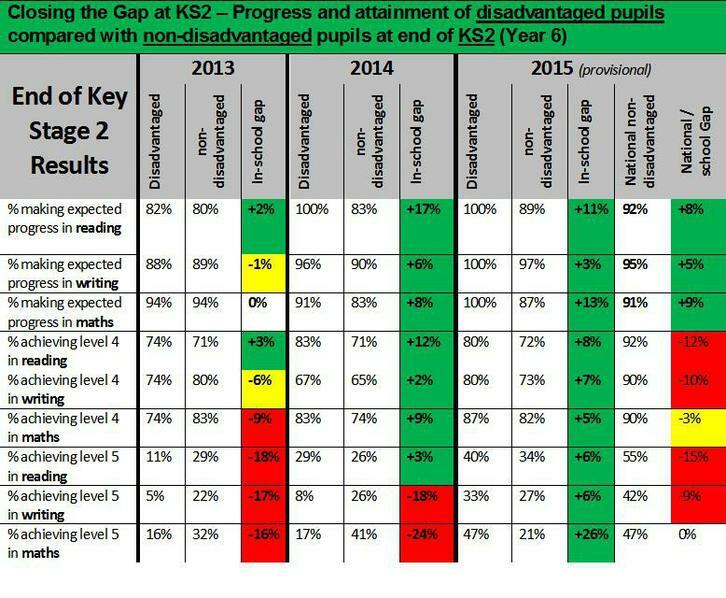 The gap between school disadvantaged children and national non-disadvantaged pupils achieving levels 4 and 5 is still wide in Reading and Writing (highlighted in Red), however is narrower than previous years. School will aim to continue to narrow this gap through use of the Pupil Premium finding. The data shows that in 2015, there was no in-school gap in attainment between disadvantaged pupils and other pupils at KS1 in Maths. 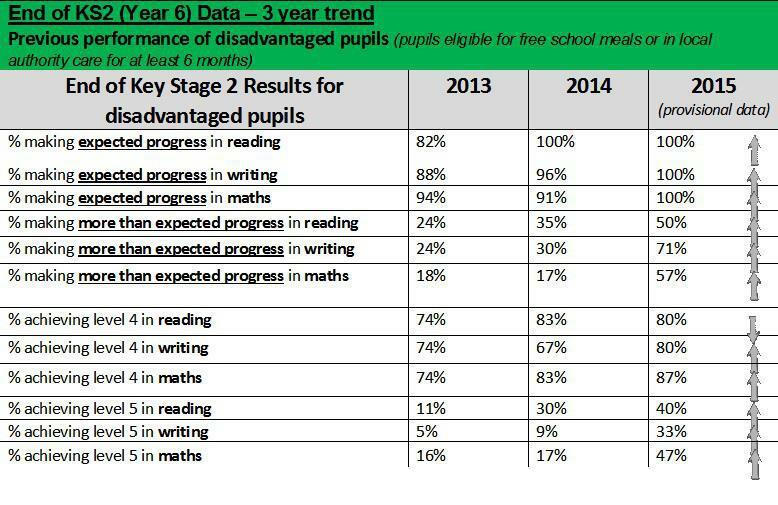 There was, however a slight in-school gap between disadvantaged pupil and other pupils in Reading, and the gap in Writing (highlighted yellow) has widened from the previous year. This will carefully monitored in subsequent years and will have implications for provision in Year 3.